I’ll be the first to admit that I don’t like meatloaf and haven’t fixed it in years. We’re just not a meatloaf family, so when I announced one day last week that we would be having meatloaf for dinner I got a very strange look from Michael. “Hmmm.” He was not convinced, and truthfully I wasn’t sure that I was either, but I was willing to try. The recipe comes from Cooking Light and the loaf has sun-dried tomatoes and lots of fresh basil. We baked it on a roasting pan so that the fat would drip away, and I was concerned that it might dry out that way, but the loaf was moist and tender and had good flavor. I made some garlic mashed potatoes and Michael and I ate a couple slices and our three-year-old and 15-month-old both ate three helpings each, definitely a signal that this was a good recipe. The fresh basil was a mix that came from our kitchen garden, grown in an AeroGarden. The basil has grown very well in it and is tall and bushy. The fragrance coming from the basil is wonderful, and we found the leaves to be very flavorful. I had just trimmed the plants back, so I had a combination of several different types of basil for the meatloaf: Genovese, Lemon, Thai, Red Rubin, Glove, and Napolitano. 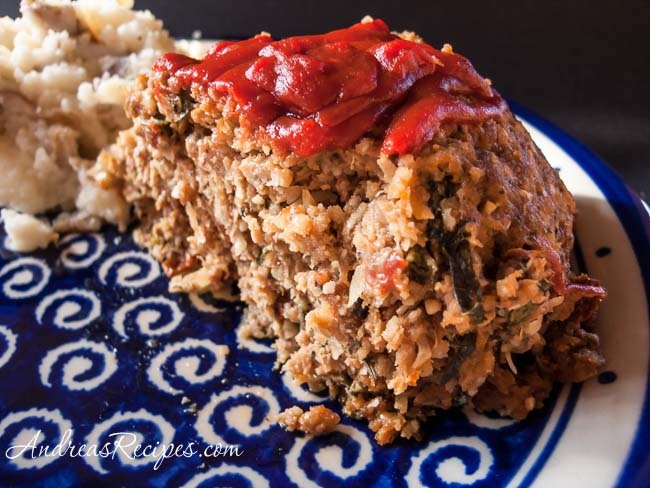 The mix of flavors in the meatloaf was very interesting, and it tasted even better the next day. The recipe has been lightened by using reconstituted sun-dried tomatoes and egg whites instead of a whole egg, but you can certainly use oil-packed sun-dried tomatoes and a whole egg instead. We used 90% lean ground chuck, and thought it worked very well. We think with some tweaking the recipe would make some delicious meatballs. This homey dish is my contribution to December’s Grow Your Own event. The deadline for Grow Your Own entries was yesterday (Ooops, I’m late for my own event! ), but because the holidays have been so busy and I’m visiting family in South Carolina, I’m extending the deadline to January 2. If you made something using your own homegrown foods in December, then you can send it to and I’ll add it to the round-up! Soak the dried tomatoes in 1 cup boiling water for about 30 minutes. Drain the tomatoes and chop finely. Set the rack in the middle of the oven and preheat to 350° F.
Put 1/2 cup ketchup, the tomatoes, breadcrumbs, onion, basil, provolone, egg whites, garlic cloves, and ground round in the large mixing bowl. Mix it all together with your hands and shape the mixture into a loaf about 9×5-inches in size. Place the loaf on the prepared broiler pan and spread 1/3 cup of ketchup over the top. Baked for about 1 hour or until a meat thermometer registers 160° F. Remove from the oven and allow to sit for about 10 minutes, then slice and serve. I made this recipe (or something very similar) last year. I don’t care for cooked ketchup at all, so made a different glaze to put on top that consisted of reduced red wine, dijon mustard, tomato sauce and brown sugar. I thought it was the best meatloaf I’d ever had, but still wasn’t good enough to put into regular rotation. Hi De! Michael suggested the meatballs idea, which would of course mean a nice marinara to go with it, so we plan to play around with the recipe that way. Happy New Year! Meatloaf for me is a comfort food. My mom used to make a stuffed meatload (rolled up like a jelly roll with and each time it had a different filling). Your recipe sounds delicious. Something my family will like. Meatloaf seems to be universal, my mom used to make it as a roll. This recipe is so different, the flavors seem to blend easily and are unique! We’re not really a meatloaf family either, but anything with 3/4 cup of that lovely basil has to be delicious!